Every athlete aspires to have a show-stopping set of guns, but many don’t have the training time available to focus on direct biceps and triceps training. Though building muscle in the arms through direct training can absolutely transfer to athletic performance and injury prevention, the big lifts—the Squat, Deadlift and Bench Press—and skill-specific tasks such as sprinting, jumping and throwing take precedence. The other inherent risk of direct arm training is going too heavy with too much volume and frequency, thereby creating vulnerable positions for the elbows and shoulders to sustain chronic or acute injuries. Simply put, direct arm training needs to be strategic and well programmed to boost performance and function. Going heavy with sloppy reps of Curls and Tricep Pushdowns will not achieve the pain-free function and muscle you are looking for. So the question remains, how do we get our athletes jacked while still working to achieve the goal, which is to improve performance in the gym and on the field of play while staying resilient against injuries? Enter the use of Blood Flow Restriction (BFR) training for direct arm work. 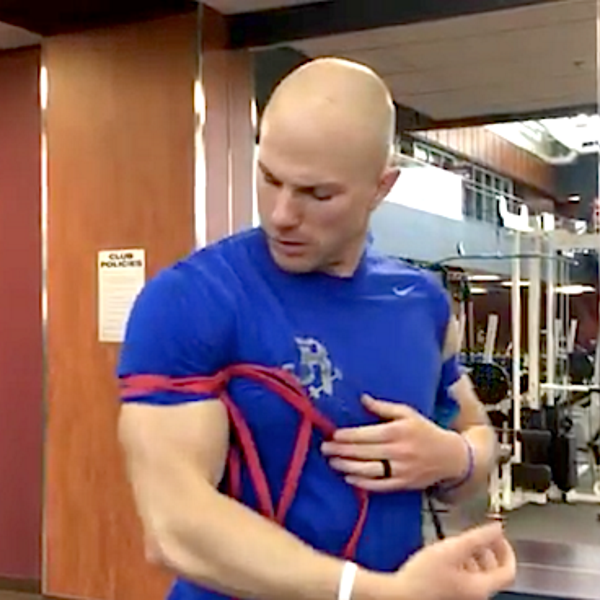 Blood Flow Restriction training involves placing a band or cuff around the upper arm to limit the amount of blood flow that goes back into central circulation during an active movement such as a Dumbbell Curl. Placing the cuff at a 7 to 10 perceived degree of tightness creates an occlusion effect in the arm, triggering a massive influx of metabolites in the tissue, secondary to the pump effect that makes this technique so notable. Blood leaves the arm at a slower rate that it would normally without the cuff, accumulating and pumping massive amounts into the active tissue being engaged in the movement. Another great thing about BFR arm training, especially for athletes who are strapped for time and want to limit joint stress, is that using lighter external loads can generate just as strong a metabolic pump effect in the muscles. After placing the bands or cuff around your upper arm, you will be using about 40 percent of the weight that you could lift maximally for a given movement. Again, using the example of a Dumbbell Curl, if you can curl 50 pounds for a single rep, you will be using 20 pounds for high rep sets of Blood Flow Restriction training. The limited weight decreases joint stress, which is advantageous not just for athletes but for anyone who wants to prioritize their orthopedic health. That’s why I have made Blood Flow Restriction arm training a staple in my Functional Hypertrophy Training program. Finally, the massive pump effect generated by high rep sets of 8-20 reps, combined with short rest periods between 15-45 seconds, creates a quick training effect, making this one of the most efficient ways to train arms for busy athletes and people with limited training time. Note: once you place the bands or cuffs on your upper arms, you should keep them on for the entirety of your sets. After you’ve completed all sets and reps, then take off the cuff. Just to be clear, do not take off the cuffs between sets. Finally, if you experience any numbness or sensory deficits like tingling, discontinue the sets and take the cuffs off.